Denver International has the second largest public art display in Colorado and is unique in being the only airport in the world with a bridge crossing an airfield. It is the largest airport in the United States and in the past decade DEN Airport has been voted 'Best Airport in North America' by the readers of Business Traveler magazine five times. The Jeppesen Terminal and Concourse C are connected by a bridge and an underground train; the former is easily accessible, with car parks located directly next to the terminal, and trains and buses taking passengers to Denver and the surrounding area. Denver DEN Airport has a full selection of restaurants, bars and shops, with a wide range of services available for the millions of passengers who pass through its gates. 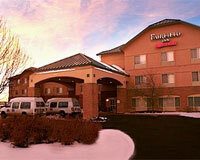 Denver World Airport Guide provides you with access to a complete selection of Denver airport hotels. 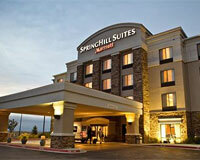 Utilize the discounts offered directly from the hotel, with the assurance of secure booking. 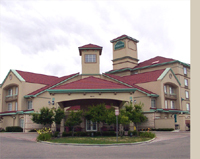 Extra services include airport car rental, airport car parking, and flights to and from Denver International Airport.